We were down in Austin, TX for the annual South By Southwest (SXSW) Music conference and festival. 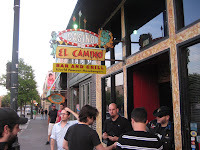 Rumor has it that Casino El Camino has the best burger in these parts and although Austin is more know for it’s BBQ and Mexican food, we had to find out. 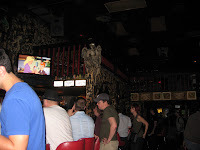 The place is touted as a “real neighborhood bar” and although its located on Austin’s East 6th Street, the party section of town that draws in tourists, it maintains its locals draw. 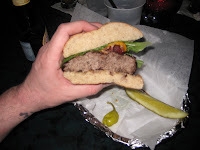 Loud music and long waits are a part of the way things are at the Casino so don’t expect a quiet meal with impeccable service, it’s a dive bar with burgers. The decor is part metal, part biker, part art house, with a vibe that really can only be what makes this unique spot what it is. 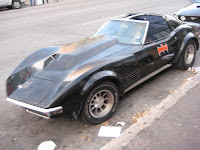 Not to mention, there was a sweet Batman Corvette parked outside. After 4 days of beer, music and heavy eaten, both Marc and I wanted to order the famous Amarillo Burger with Roasted Serrano chiles, jalapeño jack cheese and cilantro mayonnaise but felt maybe our tender insides couldn’t handle it. But hey, we came all this way and who are we to stand down in the face of a burger?!?! So we split one along with a Chicago burger with Bacon, Romaine lettuce and cheddar cheese. 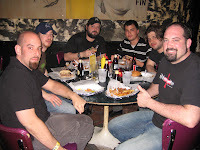 Yianni got the Buffalo Blue, while George also got the Chicago and Matt ordered the K.C. along with some chili cheese fries. Both burgers were ordered medium rare and when the Chicago arrived, it was more along medium well. They unfortunately forgot to make the Amarillo so we ate the Chicago while we waited. The whole wheat bun was a nice touch while the bacon and cheese melded together as a nice topping. 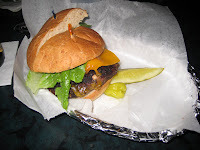 Unfortunately the over cooked burger was also bland and a little dry. I was definitely let down. Another 15 minutes later and the Amarillo burger was ready. They called Marc’s name and he picked up the burger at the kitchen. We dove right in. 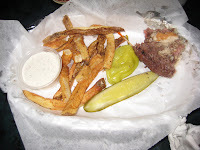 It was cooked to a perfect medium rare and un-like the Chicago, was juicy and full of flavor. No idea what happened between the 2 sandwiches. Just when I was starting to think this one was pretty tasty, the heat from the peppers kicked in. Holy smokes! It was a barn burner. The first couple of bites went down no problem but then the intensity from the peppers made it hard to continue. 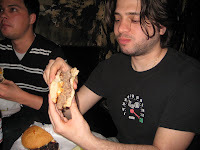 I was into the flavors bursting into my mouth and try as I might, I just couldn’t finish the burger. Not for a lack of trying but a combination of pain and fear for what might happen later. It was like running a race and collapsing right before the finish line. 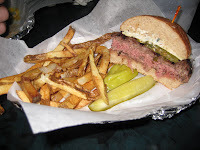 This entry was posted in Bar, Beer, Burgers, Hamburgers, Texas and tagged amarillo burger, austin, best burger, burger conquest, casino el camino, cheese, ciancio, french fries, hamburger, nyc, rev, review, sxsw, texas. Bookmark the permalink. Gotta say I was a little disappointed with Casino this time around. 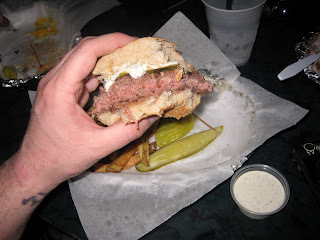 Earlier in the week, I had an amazing burger down the street at Jackalope (awesome punk rock bar with what I would say are the best burgers in Austin – I had the Frito Pie Burger). Split to with Rev. First was dry and ok. Second was cooked perfectly, but way too freakin spicy that I had to eat chili to cool my mouth down. I’ll give it another chance at SXSW 2010, but not too happy this time around. Excellent poste, I appreciate your idea of view for your idea, and I wish you a good day the pleasure of reading your future idea.